The H200i Mini-Tower Case from NZXT is a compact case with a minimal design fit for mini-ITX builds. Within this case is a CAM-powered Smart Device that simplifies fan and lighting installation and management. Moreover, it has built-in adaptive noise reduction that optimizes your build's acoustics for quiet operation. As a mini-ITX case, room is limited, so it can hold up to three or four 2.5" drives, a single 3.5" drive, and a single dual-slot graphics card. Regardless, the H200i still has plenty of cooling power with 120mm fan mounting spots on the top and rear, as well as up to a 240mm radiator support with a push/pull fan configuration at the front. 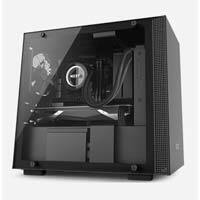 Once everything is installed, you can show off your build thanks to its tempered glass side panel.